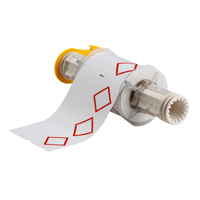 These GHS Diamond Labels are made for use with the Brady BBP85 Sign and Label Printer. They are white labels pre-printed with red GHS diamonds, which allows the printer to create 2-color GHS/CLP chemical labels in one print pass. These labels are made with our indoor/outdoor grade vinyl material that withstands exposure to moisture, chemicals and handling.